At the successful meet of International Conference of Biosensors & Bioelectronics, researchers and developers shared their experiences and ideas through research talks and presentations and put forward many thought provoking strategies in Biosensors & Bioelectronics. This event offered a platform of bringing together a forum for students, postdocs and established scientists to exchange their ideas and contributing to an integrative approach to Biosensors & Bioelectronics Research. Biosensors & Bioelectronics-2013 will provide a forum for accessing to the most up-to-date and authoritative knowledge from both commercial and academic worlds, sharing best practice in the field as well as learning about case studies of successfully integrated bio-sensing technologies. The meeting will provide an opportunity to highlight recent developments and also identify emerging future areas of growth in this exciting field. Biosensors & Bioelectronics-2013 is comprised of 11 tracks and 50 sessions designed to offer comprehensive sessions that address current issues in. 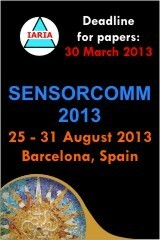 Submit your abstract today ! 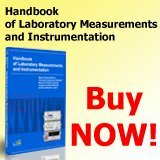 Lyon, France – March 26, 2013 – After years of limited growth, the MEMS pressure sensor market is growing due to consumer electronic applications and is expected to show a 22 % CAGR. Pressure sensors are playing an important role today in modern industries. MEMS pressure sensor is already widely adopted in different applications for its high-performance, low cost and small size. In its new report MEMS Pressure Sensor, Yole Développement gives a detailed overview of the MEMS pressure sensor markets, technologies and players. This report details the main applications in automotive, consumer, medical, industrial and high-end segment, and the main players in the industry. It also analyses the current pressure sensor technologies including MEMS technologies, and gives a detailed MEMS pressure sensor market forecast by application. MEMS pressure sensor is one of the very first MEMS components appearing in the microsystem world. The technologies are quite mature and the market is big and expected to grow from $1.9B in 2012 to $3B in 2018. 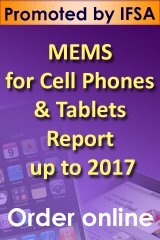 “MEMS pressure sensor for consumer applications, especially for smartphones and tablets, is following the model of accelerometers and gyroscopes. Adoption of this model will help the MEMS pressure sensor market to boom again! We believe, this huge opportunity will result in the global volume of the MEMS pressure sensor market hitting 2.8 billion units by 2018” announces Wenbin Ding, Technology & Market Analyst, MEMS Devices & Technologies at Yole Développement.”Consumer pressure sensor will represent 1.7 billion units and will overtake automotive as the market leader in volume!”, she adds. Even though the consumer application has a much lower ASP than other applications, this promising segment will bring more than 8 % CAGR to the global MEMS pressure sensor market. Yole Développement carefully watches this market. This report has consolidated market data for 2012 and provides forecasts until 2018. In this report, Yole Développement provides a global overview of the current MEMS pressure sensor technologies, market and competitive landscape. 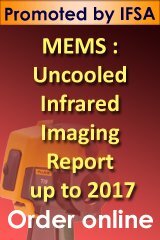 The covered industries in the MEMS pressure sensor 2013 report are automotive, industrial, medical applications, consumer electronics and high-end (aeronautic, military, defense) applications. For each of the above, Yole Développement’s report gives a market description, examples of the main applications, current market data and forecasts, the main device manufacturers and examples of products. Automotive applications are still dominating the MEMS pressure sensor market. TPMS, MAP and BAP will be the biggest sub applications in this field. Automotive, medical, industrial and high-end markets are growing 4 % to 7 % however the consumer market is growing 25 % in value (38 % in volume) because of new opportunities in smartphones and tablets. MEMS pressure sensor market forecast by applications. MEMS pressure sensor finds new applications in each domain, for example: in-cylinder pressure sensing for 2 automotive, CPAP (Continuous Positive Airway Pressure) machine for medical use, smartphone (Samsung Galaxy Slll for indoor navigation) and tablets for consumer electronics industry, etc. All these emerging applications are still in their infancy, but they appear promising and Yole Développement’s analysts believe MEMS pressure sensor will find new ways to satisfy end users in each domain. Technologies like thin-film are still needed for use in harsh environments, particularly with high temperatures and corrosive medias. MEMS pressure sensor manufacturers are also working on components which could be used in these environments. The status of SiC MEMS pressure sensor development is also described in the report. 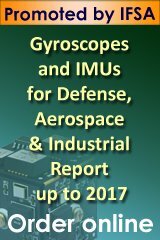 Yole Développement analysis provides an overview of other existing pressure sensor technologies. Comparisons of different MEMS technologies are done in order to better understand the positioning of MEMS pressure sensors in the global market. Since the MEMS pressure sensor market is huge, Yole Développement is not surprised to see a large number of players in this industry. It is one of the most fragmented markets. More than 50 worldwide players are involved. The top 5 players (Bosch, Denso, Sensata, GE Sensing and Freescale) represent about 50% of the total market. Automotive, medical, industrial, and high-end markets already have their mature leaders and smaller companies following. The consumer electronics market is still emerging with some conventional MEMS sensor companies interested. The report also includes a focus on the competition in the automotive market. Lots of companies are targeting this industry. Bosch has always dominated this sector. The supply chain of the automotive industry is complicated with different types of players: Car Manufacturers, Tier1 Automotive Part & Systems Suppliers (related to Pressure Sensors), Full Package Sensors Specialists and MEMS & Semiconductor Specialists. This section of the report includes a detailed description at each level of the value chain and gives an in-depth supply chain analysis for the automotive market. With new opportunities appearing in consumer electronics, new comers from the USA and China are targeting this segment. Yole Développement also follows the activities of some new Chinese challengers. Local Chinese companies are making an effort to try and fulfill the huge domestic demand in automotive and consumer applications. Microsystem devices have become increasingly visible in the Healthcare market by serving as solutions adapted to the requirements of various applications. The usefulness of these devices is 2 two-fold: for one, they improve medical device performance for the patient; and secondly, they offer competitive advantages to system manufacturers. For example, the introduction of accelerometers in pacemakers has revolutionized the treatment of cardiac diseases. The microsystem technologies market for healthcare applications looks promising, and should reach $6.6B by 2018. Yole Développement has followed this market’s innovations and key players for the last several years, and based on an accurate analysis of the market’s last three years, this new report consolidates market data for 2010-2012 and provides forecasts for 2012-2018. 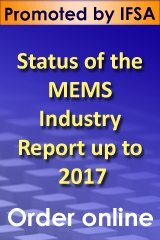 The devices considered in the BioMEMS 2013 report are pressure sensors, silicon microphones, accelerometers, gyroscopes, optical MEMS and Image sensors, microfluidic chips, microdispensers for drug delivery, flow meters, infrared temperature sensors, emerging MEMS (RFID, Strain sensors, Energy Harvesting). For each of the above, Yole Développement’s report provides a market description, the main device and system manufacturers, current market data, and forecasts. Additionally, main technological trends are reviewed. Yole Développement’s analyst, Benjamin Roussel, also takes a look at the microsystem devices dedicated to cell phone applications. Though mobile care is still in its infancy, we believe this market will grow significantly in the coming years. Furthermore, specific case studies (including technology and player-specific overviews, innovative developments, supply chain data and patent information) have been included to better address two of the industry’s hottest topics: microfluidic chips and retinal implants. Indeed, these two micro devices possess the largest growth opportunity for the coming years. The regulation particulars for medical device development, included organisms and process overview, are described for five different regions: Europe, North America, Japan, China and India. This section is particularly important for microsystem device and systems manufacturers. Microsystem devices have applications in four key healthcare markets: pharmaceutical, in-vitro diagnostics, medical devices and medical home care. Each of these markets has its own unique dynamics, players and global drivers. Motivation for the acceptance of BioMEMS technologies is highly dependent on each individual market. Whereas the acceptance of microsystems is linked to sensibility and automation constraints in the Pharmaceutical market, in the in-vitro diagnostic market it’s all about portability and cost reduction; while the Medical Devices market is focused on addition of functionalities. Concerning the Home Care market, the motivations are to increase system safety and connectivity. Yole Développement’s report reviews all four of these markets in a detailed manner. Yole Développement’s experts have identified a number of applications for each device type. These applications can be placed into five groups: patient monitoring, patient care, medical imaging, in-vitro diagnostic testing and drug delivery. For each of these groups, the report provides an overview of devices and key market drivers, along with market data. The BioMEMS 2013 report also pays particular attention to Chinese microsystems players, as a number of new players have recently entered the market.